One day after a brawl between the Washington Nationals and San Francisco Giants, Major League Baseball has levied suspensions against the two key figures in the fight. Giants relief pitcher Hunter Strickland has been suspended six games, while Nationals outfielder Bryce Harper was suspended four games. Both players have appealed the suspensions and will be available to play when the Giants and Nationals meet Tuesday night in the second game of a three-game series. Both will continue to be eligible to play until their appeals are heard. The incident occurred during the 8th inning of Monday’s game after Strickland hit Harper in the hip with a 98 mph fastball. 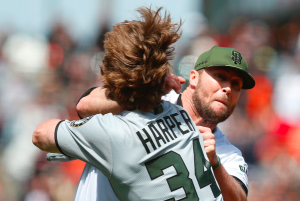 Harper then pointed to Strickland with his bat before running towards the mound, throwing his helmet in Strickland’s direction before the two engaged in a fistfight. Each player threw punches that landed before they were separated once both benches cleared. Even after the melee got under control, Strickland had to be held back and dragged back to the dugout by four of his teammates, as he remained heated and wanting a piece of Harper despite landing a punch or two. Both players were ejected from the game. The origin of Strickland’s problem with Harper dates back to the 2014 postseason when Harper hit two home runs against Strickland. The two have not faced each other since. Of course, the Giants went on to beat the Nationals in the NLDS that year on their way to winning the World Series. Predictably, Strickland denied that he hit Harper on purpose, claiming that he was simply trying to pitch to Harper inside. Of course, everyone on Washington’s side of things believes that Strickland hit Harper on purpose. Harper actually complimented Strickland for hitting him “in the right spot” and not throwing the ball around his head. However, he had little hesitation in charging the mound and starting a physical fight with the pitcher. Neither player was pleased to have received a suspension on Tuesday, but neither should have been surprised after punches were thrown and benches were cleared on Monday. “I’m obviously not thrilled about it. It’s their call. We’ll go from there. Whatever they ultimately decide, I’ll own it and take the responsibility,” Strickland said Tuesday. Ultimately, both players received a suspension that was fair, if not a little lenient. Harper missing four games for a team with a comfortable lead atop the NL East isn’t a big deal at all. If Major League Baseball wanted to prevent future brawls, they should have given the player who charged the mound a more substantial suspension. Meanwhile, Strickland, who’s been a key reliever for the Giants this season with a 1.53 ERA, may be a victim of Harper charging the mound. Even if he did hit Harper on purpose, it’s unlikely he would have received a six-game suspension had it not led to a fight. However, considering the fight, Strickland could have received a harsher suspension if MLB were more willing to make a statement.